Today I’m going to give you the Broadlink SP3S plug test. I bought these plugs (I have four but only installed two so far) to find a cheaper alternative than HS100 and HS110 Tp-link. The SP3S (the version that gives information on power consumption) is generally traded around 18/19€. Half less expensive than its equivalent at TP-link HS110. Well design, I’m not going to get into a Tolkien style description. It’s just an electrical outlet… And even by forcing oneself there won’t be much to say about it:) But since it’s the exercise, I’ll make an effort. So we are facing a 94mm x 50mm x 81.6mm white plug, which is smaller than the HS100 Tp-link (90 x 88 x 140 mm). A small button with a blue diode is located in the middle. It activates the catch manually. What’s good to know is that the plug status is updated on the application or jeedom after manual activation or deactivation. I find the blue light very nice. The quality of manufacture is really irreproachable. The catch really doesn’t cheap. At first glance one might think that it has no earth connection, but this is not the case, it is present via the two small pins at the top and bottom of the socket’s female plug. As far as the application is concerned, the Broadlink SP3S can be controlled by pressing the ON/OFF button in the middle of the screen. It is difficult to be more intuitive. But the most interesting part is the statistical part of consumption. You can easily know the instantaneous power consumed, but also have statistics of the day/week or past month. The SP3S is his little limp box. 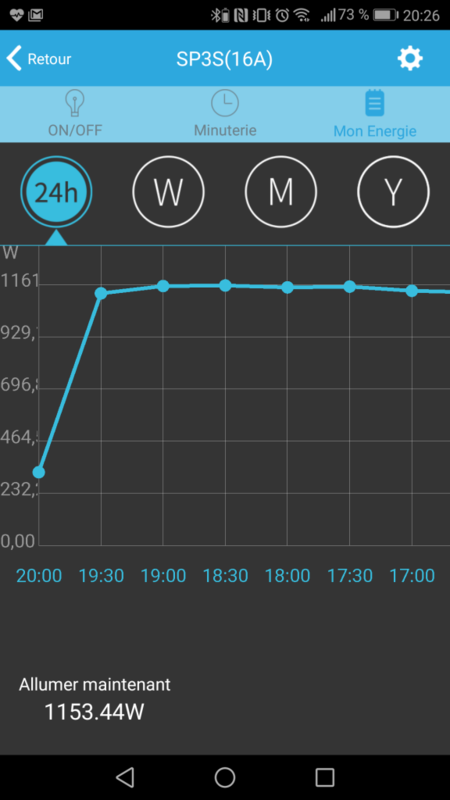 The interface showing the power consumption. 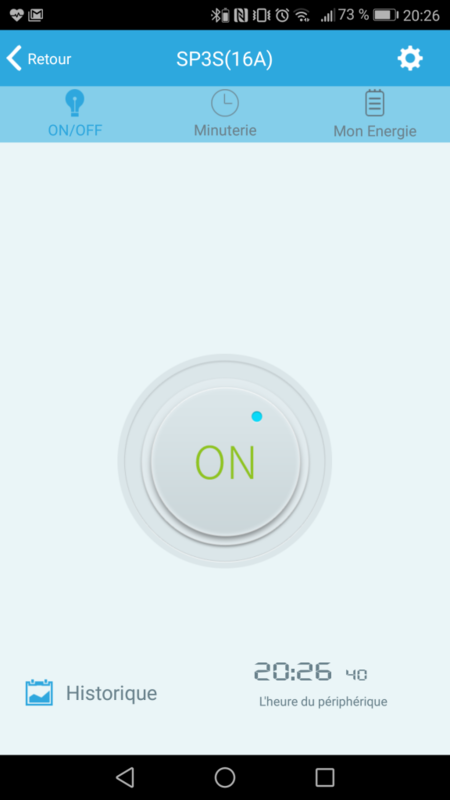 It is a connected electrical outlet, so of course it is possible to switch on or off electrical appliances remotely. What’s interesting about this one is that it can withstand an intensity of 16A or 3600W at 220V at last rather 3520W. This is more than enough to connect an electric auxiliary heater that can be controlled remotely and, above all, to automate its operation with scenarios. This is precisely my current use. 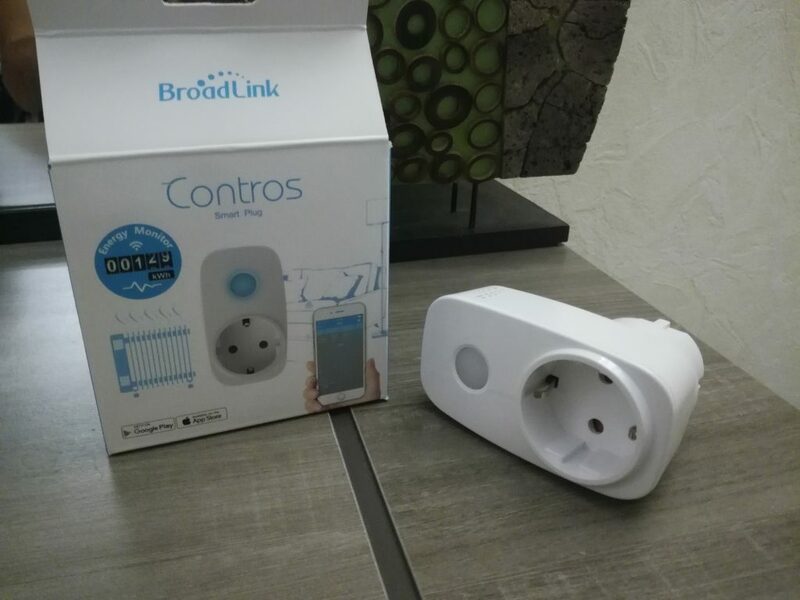 For these plugs and as for all Broadlink products (as seen with the A1 sensor), the application of the brand must be downloaded. 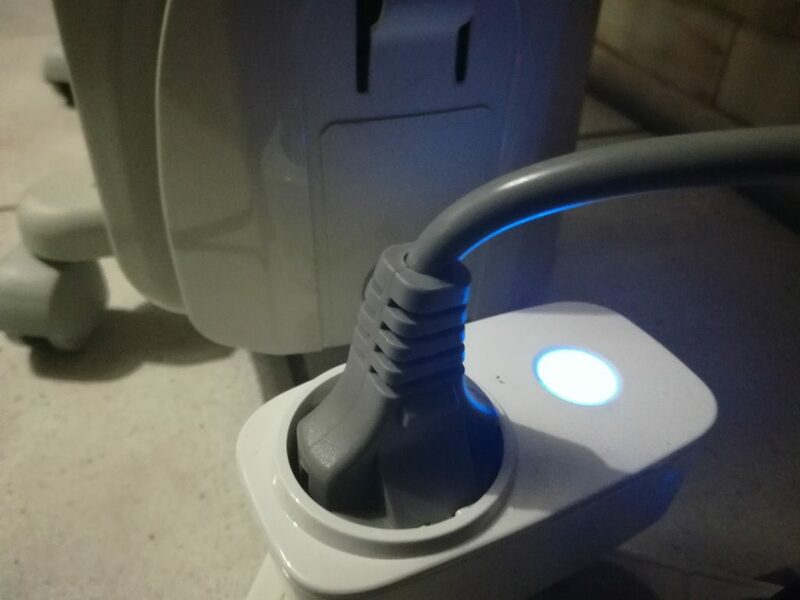 The plug is then plugged in and the plug starts to flash. We click on the button add a piece of equipment from the application, we are asked to enter our wifi parameters, we run smoothly and it’s over. Here again as for the Broadlink A1. Plugs fit easily into Jeedom. It is necessary to go through the Broadlink application, install the plug on the application beforehand and then enter its ip in the application. At this point the plug can be used via Jeedom.